Celebrate the end of the school year with a fun, family-friendly event! 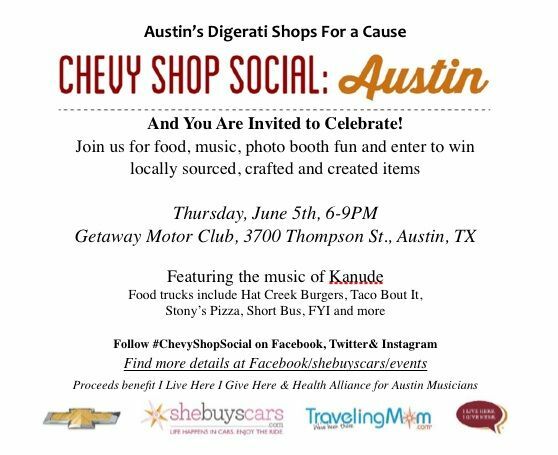 This Thursday, June 5, 2014, Austin-area influencers will shop for a cause, then donate their purchases to be raffled off to benefit I Live Here, I Give Here and Health Alliance for Austin Musicians (HAAM) that evening. The event is FREE and open to the public! Raffle tickets will be for sale at the party; each ticket gets one entry to win. Guests will enjoy live music by Kanude, food by Taco 'Bout It, Hat Creek Burger Co., Stony's pizza, Short Bus Subs, and FYI Frozen Yogurt, drink specials from TipsyTexan.com and a fleet of Chevrolet vehicles will be on display, including the fabulous new Corvette Stingray. When: Thursday, June 5, from 6-9 p.m.
For more information and event updates, follow along on the Facebook Event page.